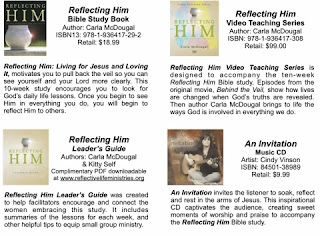 Reflecting Him is a great individual or group Bible study guide for those who want to delve into a lifestyle of faith. Set up as a ten-week course, McDougal’s attractive workbook allows plenty of space for participants to record reactions to the lessons, and offers a Leader’s Guide and Teaching Materials available to download from the Reflective Life Ministries web site. A story, a scripture “excavation” and reflection is planned out for five days of each week. While I’m not always pleased with Bible Studies that jump all over the place scripturally, McDougal carefully combines Old and New Testament scriptures with the weekly focus. For example, in Week 5, Prayer is the focus of the week, with a tour of the inside of our spiritual home the examples. Day One deals with our hidden selves in The Closet and the scripture focus is the story of David and Bathsheba; Day Two talks about our need for peaceful rest, and so on, taking a different Bible passage to work through the week. McDougal’s writing is personable and personal, encouraging with well-planned lessons and real-life application challenges. She’ll lead you on a path to a deeper walk with Jesus, our Lord and Savior. Diagrams, pictures, charts, and a bibliography make this large-size workbook attractive and useable. It won’t get lost in the sofa cushions! Set in Wisconsin, A SUMMER IN OAKVILLE is the story of a family reuniting to save the rural life they once cherished. One magical summer in fictional Oakville, Wisconsin, love finds its way through four entwined lives. Tessa's marriage hangs by a thread; her daughter, Lindsay, takes on the local town board and the developer who threatens to steal not only the farm but her heart. Tessa's widowed brother Art hasn't been home in twenty years; how can he send his out-of-control teenage son, Andy, to his aging parents? "We set out to tell the story of the changing landscape in rural Wisconsin," Lickel says. "We wanted to try something unique while using our individual strengths as authors. Shellie writes fiction for young adults, and I write older characters." "Our family, the Hasmers, could be anyone," Neumeier says. "They want to keep their heritage, while at the same time they struggle with the changing times. It's hard to make a living on a family-sized farm, and sometimes you have to make tough decisions." "In our story, the adult siblings, Tessa and Art, have their own problems but come together in order to help their parents and their children," Lickel adds. "Their children, Lindsay and Andy, are good kids who are also victims of the tough economic times and peer pressure today. But they have good hearts and learn from their grandparents' and parent's good family and faith values," Neumeier says. Black Lyon Publishing, LLC is an independently owned Oregon-based publishing house producing fiction titles in trade paperback and e-book formats, and the only Romance Writers of America recognized publisher in the state. Black Lyon titles are available at BlackLyonPublishing.com, local bookstores and most major online retailers. Best-selling author Shellie Neumeier holds a degree in Secondary Education from the University of Wisconsin, Madison, with a minor in Psychology, Sociology and Social Studies. A devoted mother of four, Shellie previously worked on staff with Northbrook Church as the King's Kids ministry assistant (serving children in grades 2nd through 5th). She is an active member of SCBWI and ACFW as well as a contributing author for various blogs. Multi-published author Lisa J. Lickel also enjoys writing and performing radio theater, short story-writing, and is an avid book reviewer and blogger. She enjoys teaching writing workshops and working with new writers. She is the editor of both Wisconsin Writers Association's Creative Wisconsin magazine and Written World Communication's OtherSheep Magazine. She lives in a hundred and sixty-year-old house in Wisconsin filled with books and dragons. Married to a high school biology teacher, she enjoys travel and quilting. 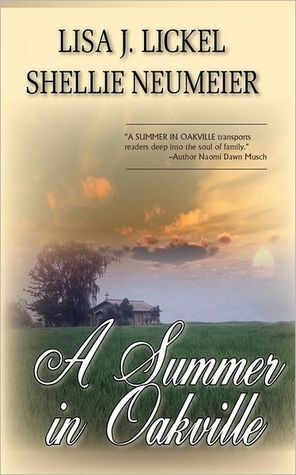 "Four sweet novellas combine to tell the charming story of A SUMMER IN OAKVILLE in Oakville. Saving your heritage, forgiving the past, and uncovering years of family secrets are weaved through four very different romances to create a delightful read that I looked forward to coming back to each day. Grab a cup of tea and enjoy." For Mystery Month! We're talking about the Gold Standard and the upcoming Map Quilt (April 2012). It's been almost a year since COTT opened its voting-booth doors and invited everyone in. Over the past twelve months, readers have chosen 25 Clash winners and received 48 free books. And along the way, a family formed. That family consists of the voters, authors, staff, and the 25+ blogs who have banded together in mutual support with COTT. This is cause for major celebration! So COTT is doing it up to the nines. Clash of the Titles' first annual Tournament of Champions begins next month! Over the course of four weeks, past winners from the previous year will compete in a series of clashes for the ultimate prize: the Laurel Award. The Laurel, COTT's most prestigious honor, is awarded by public vote to a single author among the year's champions. Voters are expected to turn out in droves to support their favorites and participate in games just for readers. Each week, COTT sponsors—consisting of various authors and staff—will issue fun challenges to readers along with the chance to win gift cards, critique services, a business card design, and more. A dozen sponsors are lined up for the event so far. That's a lot of prizes! Throughout the month, details and updates on the Tournament of Champions will be shared on the COTT website and featured within the Blog Alliance. To help spread the word, please grab the special Tournament Button (below) to display on your site. Then send a link to your page to: contactcott at gmail dot com to enter the special COTT Shout-About drawing. The drawing will take place during the first week of the Tournament and the winner will receive a Clash of the Titles mug. * Michelle Massaro is the Assistant Editor of COTT and a writer of contemporary Christian fiction. Find her on Twitter @MLMassaro or Facebook. It’s Wisconsin. It’s Winter. It’s a gruesome double-triple-quintuple? homicide spread over two cases near each other. Patrick Bowers is home, but it’s not for any sweet family reunion. The fifth entry into the Patrick Bowers, FBI geospatial profiler and coffee snob, case files is a twist-your-guts ride. You have to discover what a person regrets the most in order to understand him, Bowers’ love interest and FBI profiler, Lien-hua, says. This book is full of regret, and some redemption, as Patrick seeks to understand, forgive, and be forgiven of the circumstances that caused the rift between him and his brother, Sean. Patrick’s step-daughter deals with the regret of the circumstances that led her to kill in self-defense in the previous case. The murderer deals with the regret of…well, you’ll just have to read the book. James deviates a bit from his previous stories in that the bad guys are identified right away in The Queen, instead of making us wait to figure out what’s happening and why. Although there’s a pretty good twist, it’s still not a huge stretch to follow Patrick’s winding path to get to the bottom of things. And this is where I have to say the clunkiness of this novel tends to get in the way of the timeline and the immediate need to solve the murders. The initial murder thread trails off; the secondary case peters out until it comes back to smack the reader in the face, and by then I had nearly forgotten about it. The devastation of the murders that end up being the major plot of the story keep us all busy, in between worrying over Patrick’s headstrong teenaged step-daughter’s jaunt through a blizzard, his sister-in-law’s fragility, the growing body count, and whether the intimate details of the weapons being used or the minute description of the interior of the ELF station really has anything to do with the outcome. I put this book down several times, despite the fact that I love the first novels and will read the rest of them; despite the fact that I went to the nearby University just about the time the Navy station set up to use Extremely Low Frequency (ELF) radio waves to signal submarines was encountering the worst protests; and despite the fact that I was pretty sure I had the real murderer pegged (I was wrong). Patrick Bowers is a great character, the adversary in The Queen was daunting, the plot was a little windy but it worked, and the end was…intriguing. James manages to draw in several former cases to twine this story and I look forward to the next installment. Kia Ora from New Zealand and hello from Splashdown! 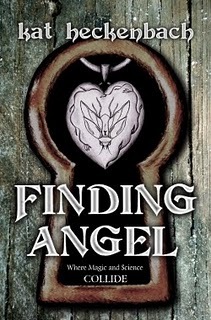 Finding Angel, the first novel by veteran author Kat Heckenbach, is here! It's aimed at middle-graders and young adults, but fantasy-minded grown-ups will love it too. Perfect for reading with or without kids! She follows Gregor to her homeland…a world unlike any she has imagined, where she travels a path of self-discovery that leads directly to her role in an ancient Prophecy…and to the madman who set her fate in motion. Available at Amazon (in Kindle too). Other retailers are taking their time to list it, but you can get Epub for Nook at Smashwords right now along with many other formats. http://www.splashdownbooks.com/ has a new face. Check out the new-and-improved, easier-to-navigate website. Find books faster. See what's new with your favorite authors. Handy drop-downs and a splashy backdrop are just a few of the upgrades. Drop by and dive in! Splashdown's first group anthology made a big splash at Amazon, rising to #1 in Bestselling Science Fiction and Fantasy Anthologies shortly after going public! 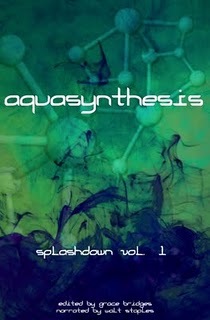 See what all the fuss is about with stories from all the current Splashdown authors - Fred Warren, Caprice Hokstad, P.A. Baines, Adam Graham, R.L. Copple, Travis Perry, Mike Lynch, Keven Newsome, Kat Heckenbach, Grace Bridges and Ryan Grabow, with narration from Walt Staples. $5.98 in print or $2.99 in e! 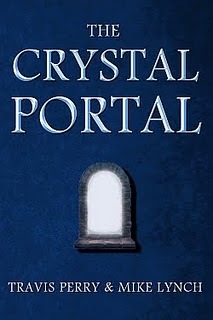 The Crystal Portal e-book by Travis Perry and Mike Lynch is available for $2.99 this month only. Check it out at Kindle and Smashwords! Caprice Hokstad's Nor Iron Bars a Cage finaled in the Global eBook Awards! The full list is here - look for the Speculative Fiction: Fantasy category. Keven Newsome's Winter now wears 22 five-star reviews at Amazon! Next month sees the release of The Seer by Fred Warren - the long-awaited sequel to The Muse. It's a doozy, I can tell you! Avenir Eclectia has passed a total of 75 mini-stories in its shared world. Why not get on board?